In this tutorial, we will explore the car’s market using K-nearest neighbors (KNN) regression algorithm. The k-nearest neighbors algorithm is based around the simple idea of predicting unknown values by matching them with the most similar known values. Suppose that we have 3 different types of cars. We know the name of the car, its horsepower, whether or not it has racing stripes, and whether or not it’s fast. We want to figure out if the car is fast or not. In order to predict if it is with k nearest neighbors, we first find the most similar known car. The most similar is defined by the nearest Euclidean distance to that particular point. In this case, we would compare the horsepower and racing_stripes values to find the most similar car, which is the Yugo. Since the Yugo is fast, we would predict that the Camaro is also fast. This is an example of 1-nearest neighbors – we only looked at the most similar car, giving us a k of 1. If we performed a 2-nearest neighbors, we would end up with 2 True values (for the Delorean and the Yugo), which would average out to True. The Delorean and Yugo are the two most similar cars, giving us a k of 2. If we did 3-nearest neighbors, we would end up with 2 True values and a False value, which would average out to True. If the predicting values are of type float rather than boolean, similarly, we would take an average of the numerical values. The number of neighbors we use for k-nearest neighbors (k) can be any value less than the number of rows in our dataset. In practice, looking at only a few neighbors makes the algorithm perform better, because the less similar the neighbors are to our data, the worse the prediction will be. For each car we have information about the technical aspects of the vehicle such as the motor’s displacement, the weight of the car, the miles per gallon, how fast the car accelerates, and more. Read more about the data set here. # Because `price` is the column we want to predict, let's remove any rows with missing `price` values. # Replace missing values in other columns using column means. # Confirm that there's no more missing values! # Randomize order of rows in data frame. # Divide number of rows in half and round. # Use this function to train and test univariate models using the different numeric columns in the data set. 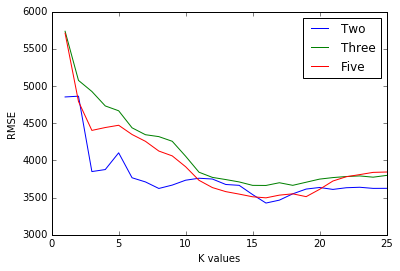 # For the top 3 models in the last step, vary the hyperparameter value from 1 to 25 and plot the resulting RMSE values. Modify the knn_train_test() function to use k-fold cross validation instead of test/train validation. Modify the knn_train_test() function to perform the data cleaning as well.